Mairbek Taisumov isn't happy with Anthony Pettis and he explained why after his win this past weekend at UFC Moscow. Mairbek Taisumov only just fought this past weekend at UFC Moscow, but the Russian isn’t going to rest on his laurels. 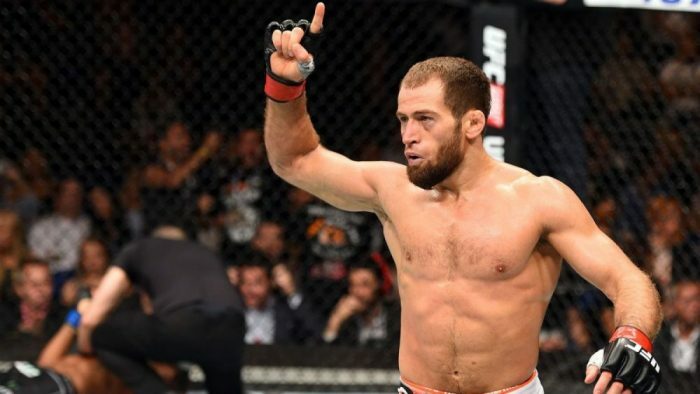 After missing weight by 5-pounds on Friday after complications with his weight cut, Taisumov proceeded to defeat his opponent Desmond Green via a unanimous decision and pick up his sixth straight win. Although the American pushed Taisumov further than most of his recent opponents, Green failed to win a round on the scorecards with Taisumov taking a clean sweep 30-27 across the board. After picking up his win of the year, Taisumov spoke backstage about his recent struggles to get a fight and he pinpointed UFC lightweight Anthony Pettis as one of the main men avoiding him at all costs. After taking a shot at Pettis, Taisumov then took aim at UFC lightweight Kevin Lee. Failing that, Taisumov said he’d be willing to fight any man at any time. Given his current visa issues with the US that might prove to be a little difficult, but nonetheless he was willing to throw the challenge out to the whole UFC 155-pounds division.